Construction has started on the first mountain bike trails in Beatty. Trail work started on Valentine’s Day weekend while the organization behind the project develops a master plan. Saving Toads thru Off Road Racing, Ranching and Mining in Oasis Valley, commonly known as STORM-OV, is a nonprofit run by David Spicer, owner of Spicer Ranch. The group put out an open invitation to volunteers and mountain bike riders to come and help with the construction. 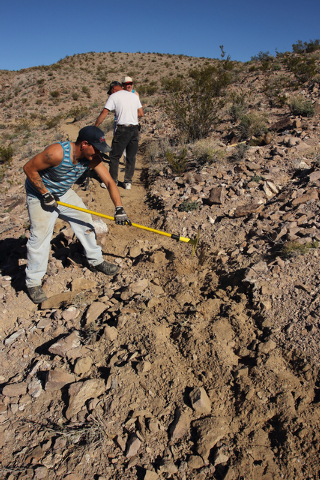 The three-day project ran Feb. 13-15, and focused on construction of the first few miles of mountain bike trails. “Our master plan for the full 200-to-300 miles of trails will be completed in March for the entire valley, most of which will be on public land,” Spicer wrote in a recent letter in an appeal for volunteers. Approximately 15 people participated during that weekend. One couple, Rachel Hart and her husband Brent, came from Reno. On Valentine’s Day, while most couples were out having a nice dinner or out with their loved ones on a romantic excursion, Rachel Hart was on the Spicer Ranch digging a trail with her family. “I love mountain biking, and I don’t fault my husband for the weekend. We had a great time out in the sun,” Rachel Hart said. The Harts and others who came from out-of-town were put up on the ranch. Rachel Hart said she loved the trails and would definitely come back when finished. Rachel said from the heights she was at she could see the entire Oasis Valley and all the way to parts of Death Valley. She also loved being out of the snow. “We mountain bike in Reno and to be able to come down here and be warm was a plus,” she said. Neil King, foreman for the volunteers, said to date about four miles of trail have been completed by crews. The next milestone will be the seven-mile mark according to Cimarron Chacon, a trails consultant from Grow Promotions, hired to design the trails for STORM-OV. Spicer in the near future wants to transform Beatty into a premiere mountain biking community. “Our endeavor here will serve as an immediate area to have events and races on and demonstrate to the land management agencies how trails are built and the economic benefit to the towns around them,” he said.